November 20, 1:15pm, Tuesday Theatre presents a tale of love, “a vow,” that refuses to be forgotten. A car accident puts Paige (Rachel McAdams) into a coma. Her husband, Leo (Channing Tatum) is devastated, but will not give up as he works to rekindle the love she has forgotten along with five year’s worth of memories. Rated PG-13. November 23, 10am – noon, Coffee Hour – Join us for a cup of coffee or tea, a sweet or two and good conversation. Suitable for all ages! 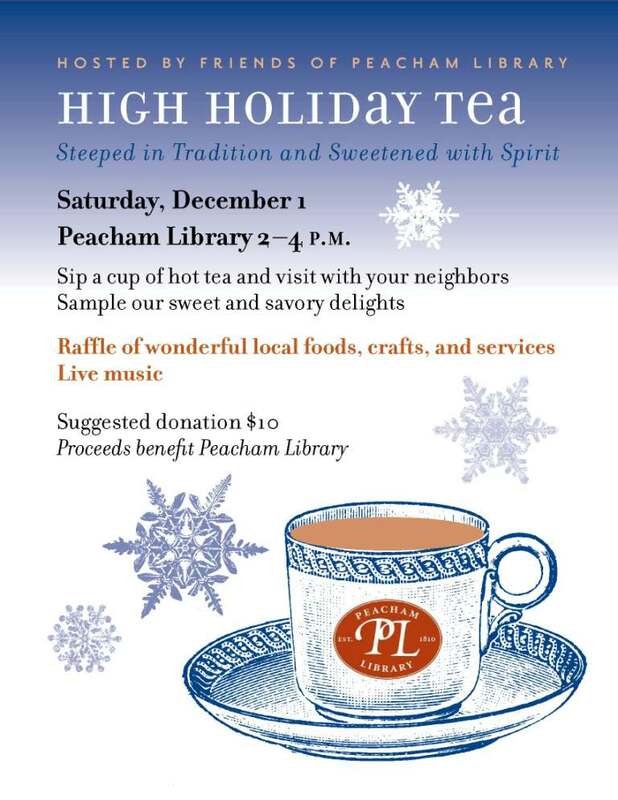 December 1, 2-4pm, High Holiday Tea — a fund raising event for Friends of Peacham Library. December 7, 9:00am, Preschool Story Time, stories, crafts and activities for the young and their parents.